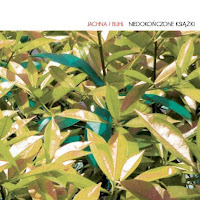 On their second album, Polish musicians Wojtek Jachna on trumpet, flugehorn and electronics and Jacek Buhl on drums continue their journey, although a little more erratically. It is fun at times, as on the highly rhythmic "Bernstein's Mood", with really great moments at others, as on the more free form "Tajemne Schody". But the overall approach lacks coherency, it's like tasting from various fruits in a market place without being able to decide which one to buy in the end. "W Słońcu Dawnych Dni" offers a more soft rock electronic background, with full reverb melancholy playing, "Przypływ Odpływ" is all electronics and noise,"Katastrofa w Porcie" brings us in the realm of Nils Petter Molvaer, etc. The challenge of every artist is to make a choice, and rather than demonstrating a wide variety of skills, to come with a unique voice and vision. The ingredients are here, but this voice is still absent. Radical unity is needed. I'm interested to hear what's coming.